Cylindrical roller bearings are characterized by high radial-, and moderate thrust-load capacities. They contain cylindrically-shaped roller, which are nevertheless not true cylinders. Instead, they are crowned or end-relieved to reduce stress concentrations. This particular geometry results in low friction and allows high-speed applications. The NU and N types exhibit their best performance when used as free side bearings since they adjust to the shaft's axial movement, to a certain extent, relative to the housing position. The NJ and NF types carry axial load in one direction, while the NUP and NH types can carry a certain degree of axial load in both directions. Type R cylindrical roller bearings feature enhanced load rating compared to standard series, though both have equal dimensions. This effect has been achieved thanks to a different interior design of type R bearings. They are identified by supplementary code "R". Double-row cylindrical roller bearings come in two types: with a cylindrical or a tapered bore. As for those with a tapered bore, the specified amount of clearance can be obtained by adjusting the press-in distance. Some bearings are fitted with lubrication holes and lubrication grooves on the outer ring. They are identified by supplementary code "W". These bearings can accommodate high radial loads, and are often used in machine tool spindles. A machined bronze retainer maintains proper distance between the rolling elements and is very effective for high-speed applications. It reduces vibration, has a quiet operation and can accommodate heavy radial and impact loading. Another option is to have separable inner or outer rings. This simplifies the mounting and dismounting. Crane rope sheaves and running wheels which are operated at low or medium speed are generally equipped with full complement type cylindrical roller bearings because the operation of these machines involves heavy, impact loading. These bearings are divided into shielded and open types. The shielded type is often used with the outer ring rotation. The shielded type was developed for use with rope sheaves. It is shielded, non-separable and pre-lubricated with grease. Bearings with locating snap rings around the outer ring can be positioned and fitted to sheaves with ease. The bearing surface is coated with phosphate for rust prevention. Open type bearings are further divided into those used on the fixed side and those used on the free side. The former carries axial load in both directions. The relative position of the latter's inner ring and outer ring can be adjusted by moving them along the axis. Open type bearings are separable because the outer ring is divided into two annular pieces in a plane perpendicular to its axis. Triple-row and four-row roller bearings are available alongside with double-row types. 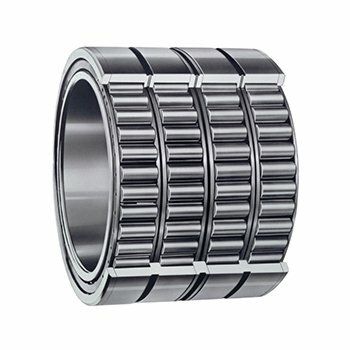 Rolling mill roll neck four-row cylindrical roller bearings are designed to achieve the maximum capacity in a limited space. The inner ring raceway surface and the roll can be finished simultaneously after the inner ring is mounted on the roll neck. This feature is useful in improving rolling mill accuracy.